Advice on how to manage short positions, specifically how to calculate a daily trailing stop, is given today for members to protect profits. Advice on how to manage short positions is given this week with an hourly chart to support members trading. A break below the small best fit channel on the daily chart indicated a trend change for US Oil. Members were then advised to enter a short position. Short positions are now positive. Summary: The target is at least a new low below 47.06; it should be comfortably below that point. Within the bear market, cycle wave b is seen as ending in May 2011. Thereafter, a five wave structure downwards for cycle wave c begins. Within cycle wave c, at this stage it does not look like primary wave 5 could be complete. That would only be possible if primary wave 4 was over too quickly. Primary wave 1 is a short impulse lasting five months. Primary wave 2 is a very deep 0.94 zigzag lasting 22 months. Primary wave 3 is a complete impulse with no Fibonacci ratio to primary wave 1. It lasted 30 months. Primary wave 4 is likely to exhibit alternation with primary wave 2. Primary wave 4 is most likely to be a flat, combination or triangle. Within all of these types of structures, the first movement subdivides as a three. The least likely structure for primary wave 4 is a zigzag. Primary wave 4 is likely to end within the price territory of the fourth wave of one lesser degree; intermediate wave (4) has its range from 42.03 to 62.58. If primary wave 4 is incomplete, then it looks like it may not remain contained within the channel. Sometimes fourth waves overshoot channels and this is why Elliott developed a second technique to redraw the channel when it does not contain a fourth wave. Primary wave 4 is most likely to be shallow to exhibit alternation in depth with primary wave 2. So far it has passed the 0.382 Fibonacci ratio at 45.52. It may now continue to move mostly sideways in a large range. Primary wave 4 may not move into primary wave 1 price territory above 74.96. At this stage, primary wave 4 has completed intermediate wave (A) only. Intermediate wave (B) is incomplete. The whole structure of primary wave 4 is seen here in more detail. The first wave labelled intermediate wave (A) is seen as a double zigzag, which is classified as a three. Intermediate wave (B) is also a three. This means primary wave 4 is most likely unfolding as a flat correction if my analysis of intermediate wave (A) is correct. Flats are very common structures. Intermediate wave (B) began with a zigzag downwards. This indicates it too is unfolding most likely as a flat correction. Within intermediate wave (B), the zigzag upwards for minor wave B is a 1.29 correction of minor wave A. This indicates intermediate wave (B) may be unfolding as an expanded flat, the most common type. The normal range for intermediate wave (B) within a flat correction for primary wave 4 is from 1 to 1.38 the length of intermediate wave (A) giving a range from 26.06 to 16.33. 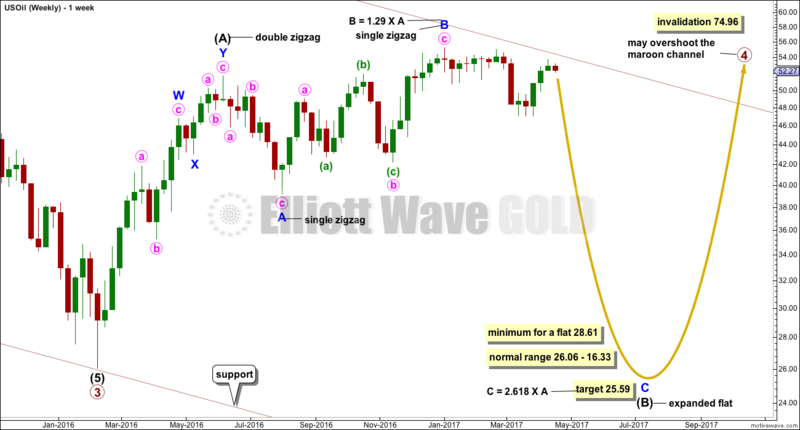 Within the larger expanded flat correction of primary wave 4, intermediate wave (B) must retrace a minimum 0.9 length of intermediate wave (A) at 28.61 or below. Minor wave C downwards must subdivide as a five wave structure. Within minor wave C, minute waves i and ii should be complete and minute wave iii must be incomplete. 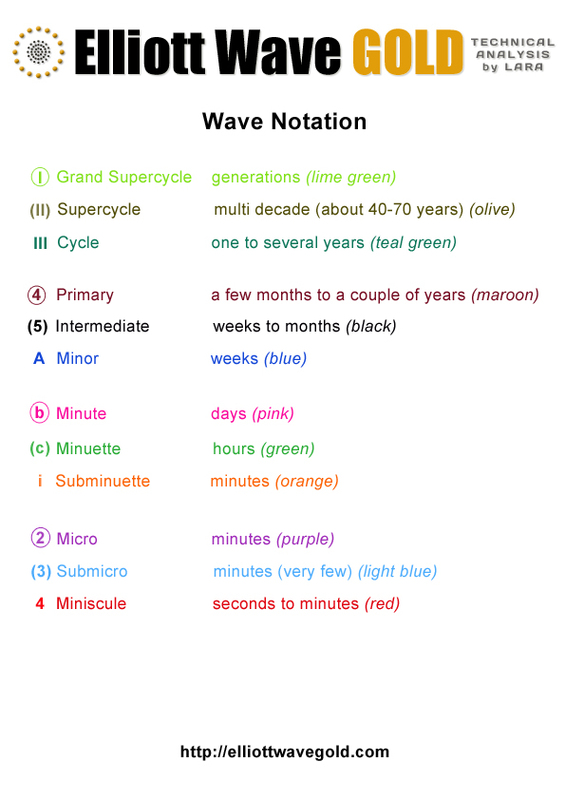 Upwards movement, which is labelled minuette wave (ii), cannot be minute wave iv as it overlaps back into minute wave i price territory. Within minute wave iii, minuette wave (i) is complete and minuette wave (ii) now looks most likely to be over. A small best fit channel is drawn about the zigzag of minuette wave (ii). This channel is now breached providing trend channel confirmation of a trend change. This wave count would now expect an increase in downwards momentum. Minuette wave (iii) must make a new low below the end of minuette wave (i) at 47.06. It must move far enough below that point to allow for subsequent upwards movement for minuette wave (iv) to unfold and remain below minuette wave (i) price territory. Within minuette wave (iii), no second wave correction may move beyond the start of its first wave above 53.76. The cyan trend line is drawn from the high labelled minor wave B to the next swing high labelled minute wave ii. This is a Magee trend line for a bear market. Expect that US Oil is most likely in a downwards trend as long as price remains below this cyan trend line. 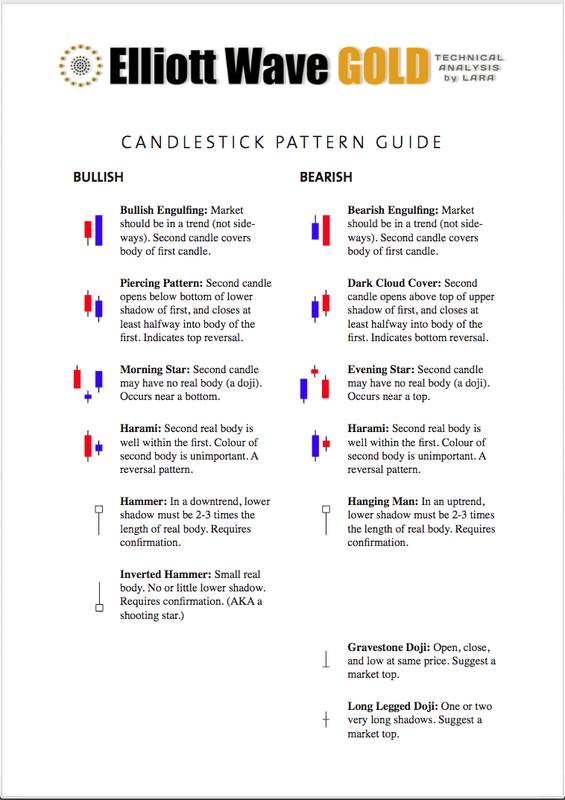 The candlestick of the 12th of April completes a Bearish Engulfing Candlestick reversal pattern. The important condition for this pattern (where the close of the second candlestick is below the open of the first) is met. This is one of the most reliable reversal patterns. It works more often than not, but not always. An example of it not working is shown on the 3rd of April. The reversal pattern of the 12th of April has support from volume whereas the 3rd of April did not. This increases the probability that price may reverse here. 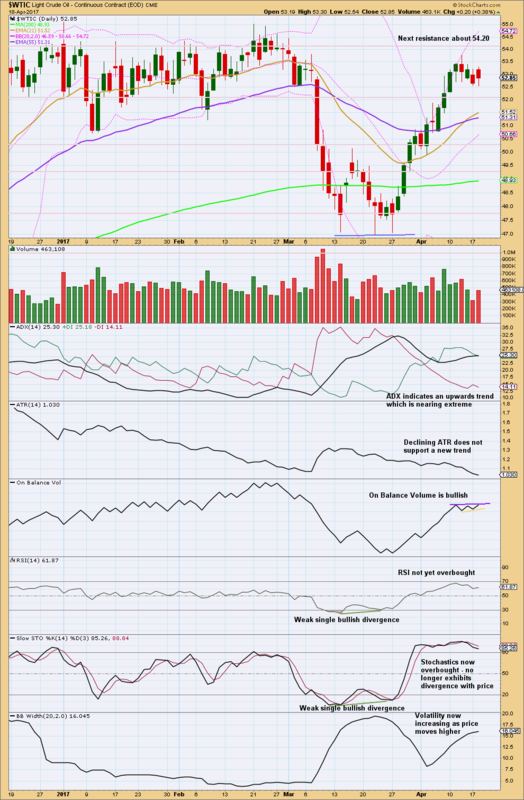 The long lower wick on the last daily candlestick for the 18th of April is bullish, as is stronger volume to support upwards movement of price during the session (indicated by On Balance Volume moving higher for this session). This bounce may move a little higher. New trend lines are drawn on On Balance Volume. These do not yet have good technical significance, so a breach here would be only a weak signal. Normally, volatility should decline as price rises and volatility should increase as price falls. Divergence from this normal can provide a bullish or bearish signal for Oil. For the last session, here dated the 18th of April, volatility has declined below the 11th of April but price has not made a new high. This divergence is bearish and supports the idea of a trend change here for Oil. This analysis is published @ 03:07 a.m. EST. Again, last week expected downwards movement from US Oil but price continues higher. 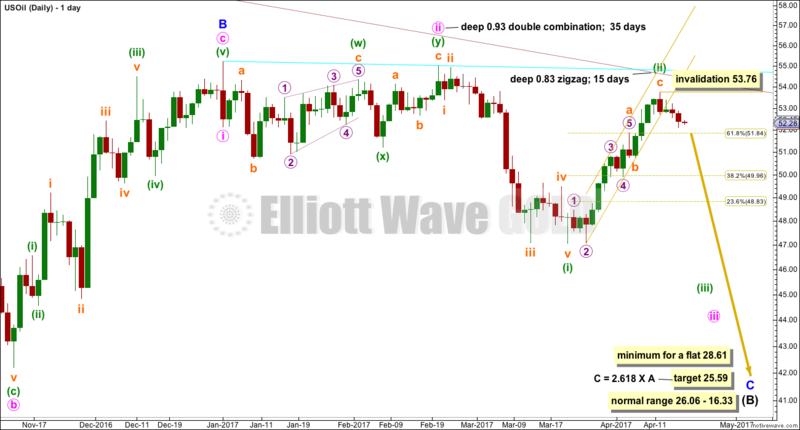 The main Elliott wave count was invalidated leaving only one wave count now, which was last week’s alternate. Price has moved higher over the last few days. Price is now moving sideways again. Some strategies for traders are outlined today. A small correction unfolded over the last week as expected. Last weekly analysis expected a violent downwards breakout as likely. This is exactly what happened. Alternate wave counts are now invalidated. The classic technical analysis picture has changed this week for US Oil. On Balance Volume is now giving a strong signal as to which direction price may break out. Price has been consolidating now for about twelve weeks. There will be a breakout and it may come soon. This consolidation has now lasted for about 12 weeks. 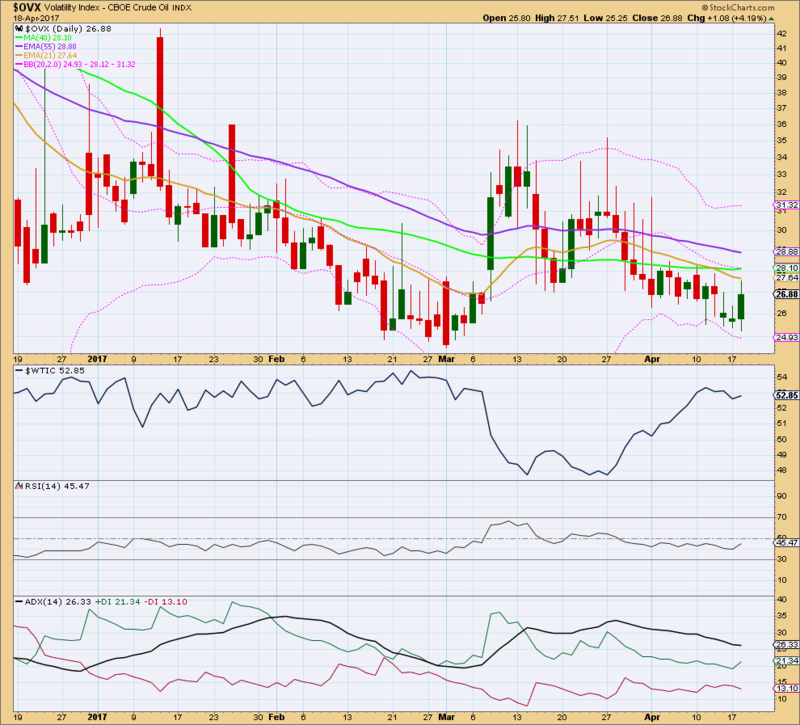 The breakout should come soon now. Volume and On Balance Volume are giving strong signals as to which direction the breakout is most likely to be. Members are offered some advice on how to approach this market this week. Price is still range bound. On Balance Volume is giving a strong signal about what direction price will break out. Again, price continues to consolidate for US Oil and On Balance Volume may assist to show the breakout direction, so it should be watched carefully. 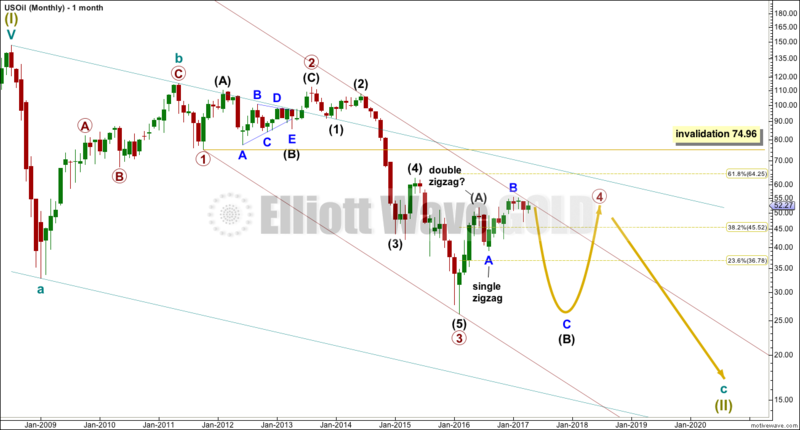 The Elliott wave counts remain the same. Price continues to consolidate for US Oil. On Balance Volume may assist to show the breakout direction, so it should be watched carefully.